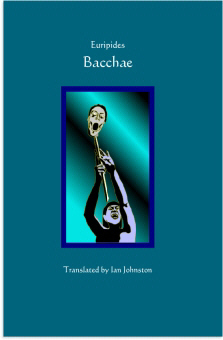 Euripides' Bacchae, the last of the surviving Greek tragedies, was not performed during the lifetime of the playwright. Its first production took place a year later (in 405 BC) in the annual competition for tragic drama, where it won first prize. It has remained one of the best-known and most frequently performed Greek tragedies ever since, one of the greatest works of classical Greek culture. The Bacchae holds up a desperate view of human experience, a vision that led Aristotle to call Euripides "the most tragic of the poets." Here the royal power in the polis, represented by the young king of Thebes, Pentheus, is quite incapable of dealing with a political crisis in an effective way, and the god who has initiated the crisis, Dionysus, a son of Zeus and a cousin of Pentheus, displays a selfish, arrogant, and unforgiving malice which leads him to destroy in the most horrific way the oldest human royal family in Greek legend because he believes he has been insulted by the citizens of Thebes. Whatever hopes men entertain for a peaceful harmony between the gods who rule the world and the human beings who live in it are here exposed as futile and cruel delusions.